We respect the children as valued customers. We give the children time and space to eat in a calm and attractive environment. We help the children to see that enjoying food and eating meals with others contributes to a happy lifestyle. We encourage the children to find out more about achieving a healthy balance, to try new foods, and new flavours in a supportive environment. 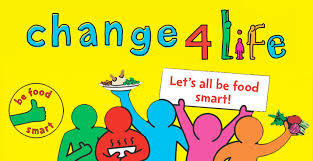 We promote school food to children, parents and carers. We listen to and accept constructive feedback and respond accordingly. 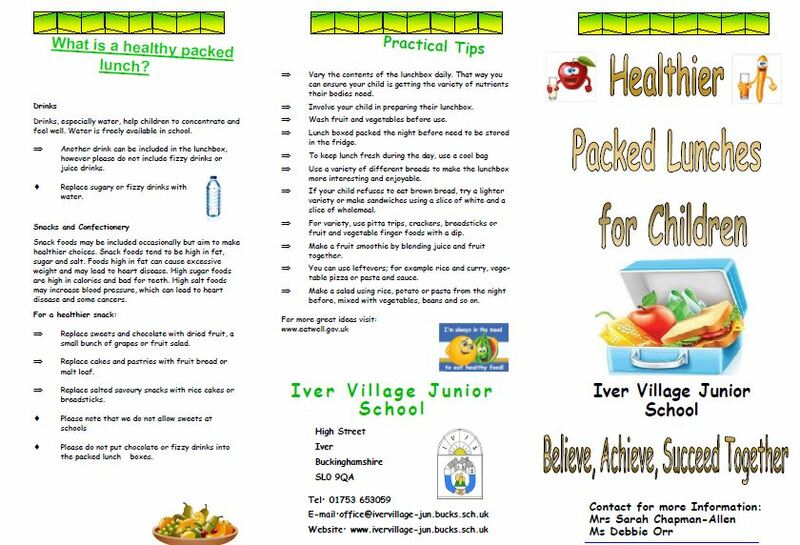 As a Health Promoting School, Iver Village Junior School is committed to encouraging and developing positive attitudes towards food and a healthy diet. Promoting a healthy lifestyle is integral to our curriculum and we recognise the importance of offering children the opportunity to make informed choices about what, when, where and why they eat. As a school we know that food is fundamental to the quality of a child’s life, not just in providing essential nutrition but in communicating and sharing positive values, attitudes and experiences with each other. We believe that adults (staff, parents and carers) should be good role models and should support the children in understanding how balanced nutrition contributes to a person’s health, happiness and well-being. 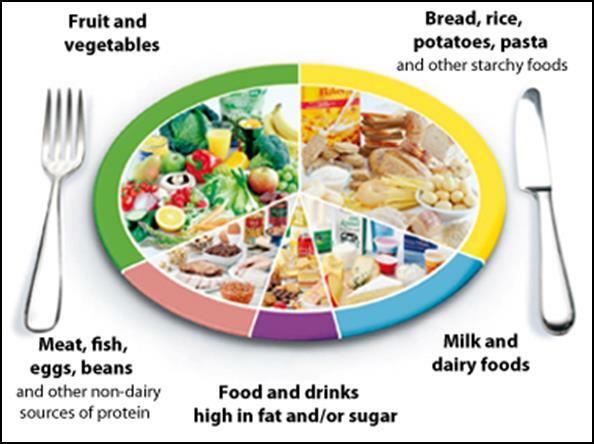 As part of a balanced diet containing carbohydrates, fats, protein and fruit and vegetables, the amount of fruit and vegetables eaten has been identified at a national level as a concern. There is therefore a nationwide policy to encourage everyone to eat more fruit and vegetables. The school promotes fruit and vegetables as a healthy snack. ​We regard healthy eating education as a whole-school issue, and we believe that opportunities to teach about the importance of living a healthy lifestyle occur throughout the curriculum. Healthy eating education forms an important part of our school’s curriculum. The importance of balanced nutrition and healthy food choices is explicitly taught through the Science, DT and PSHE curriculum. All pupils have the opportunity to learn about safe food preparation and to learn about where food comes from. Pupils learn about the requirements for plant growth, the food chain and the components of a healthy diet through the Science Curriculum. Key Stage 2 children will be encouraged to eat only fruit or vegetables at break time. All children are encouraged to bring in a water bottle so they can have access to water throughout the day. Water fountains are also provided in the school for additional access to drinking water. Chocolate, sweets, biscuits, crisps and cakes are actively discouraged as everyday snacks in school or as part of lunch boxes. Chewing gum and fizzy drinks are not permitted in the school premises or while the children are representing the school. Cereal bars are also discouraged because these can often contain as much sugar as chocolate bars. The contents of pupils’ lunchboxes will be monitored by the lunchtime supervisors with any concerns being passed onto the class teacher. ​The school community is aware of the possibility of food allergies within the school population, particularly nut allergies. Parents or carers of children who are on special diets for medical or religious reasons, or have allergies, will be asked to provide as much information as possible about which foods are suitable or foods which must be avoided. This information will be displayed in the staff room and school kitchen. Information is also collected on the signs/symptoms and treatment for children having an allergic reaction. We are therefore a NUT FREE school. Portions – no child is made to finish all the food that they are offered because we know that appetites vary from person to person. However, we do actively encourage the children to “try a little bit more” if they can, to ensure that they are not hungry later on in the day. For further information on Healthy packed lunches please see our Healthy packed lunch leaflet and policy and our powerpoint from the Parent’s coffee morning. The hot meal service is offered through Dolce. We work closely with the school cook and with Dolce to ensure the healthiest possible meals are provided. Bread and fresh fruit are always provided. The weekly school food menu is displayed on our schools website and available in reception. Parents and Carers can pre-order their child’s meal both at home and at school. The weekly lunch menu is sent home on a termly basis for Parents/Carers and children to discuss meal choices. Please click the thumbnail above to download the healthy eating leaflet. Please click the thumbnail above to download the healthy eating policy.